Maybe it was the genocidal maniac equivalent of a warm-up stretch? Comic Book Urban Legends says how the boss of the Alliance of the Evil was originally going to be the Owl. 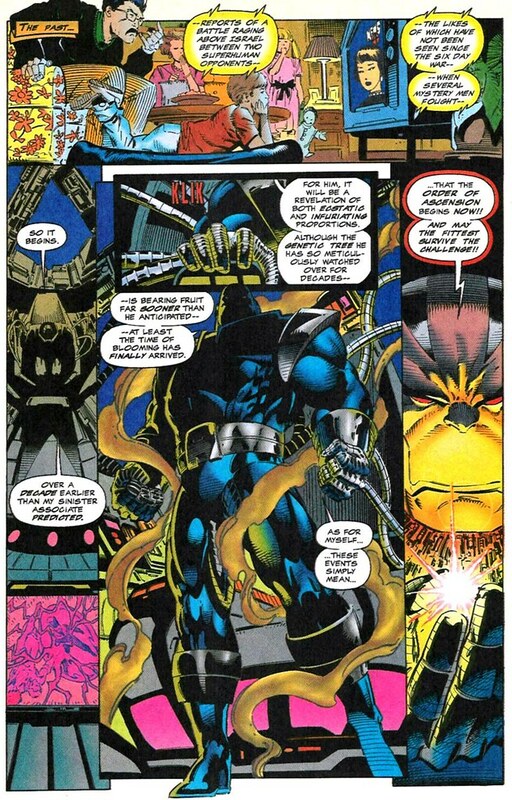 Louise Simonson took over writing the book and asked that the "mysterious boss" be changed in the final panel to someone named Apocalypse. It wasn't until X-FACTOR #24 that Apocalypse revealed he was thousands of years old and had access to extremely advanced alien technology. Oh that's not an urban legend, that's true. Still means he's stuck with that as his debut. Wasn't it more like 13-14 or years early since David was never born as a result of wipingout Charles and he was a teenager IIRC. I'd think it was the exposing of mutants earlier that did more damage than Apocalypse. There was no force in place to argue the mutants side of thing so humans probably cracked down much harder on mutants and as a result hordes of mutants probably rushed to ally with Apocalypse giving him a much bigger power base to attack with. The Avengers and even the FF4 wouldn't have gained their abilities yet so in a lot of ways the time travel woke old Pocket Lips up early enough that he got a free pass to get a foot hold. Well, Poccy mentions over a decade so I was rounding. I always loved the AoA series. Best thing Marvel did in the last 20 years. I've looked at my copy of LegonQuest. The 4 X-Men who follow Legion back specifically state that they have gone back 20 years into the past. It's implied that this is not long before Legion's conception by Gabrielle Haller, so that would make him 19 at best. Apocalypse suggests Sinister predicted mutants would become prevalent over a decade later, which would imply he means less than 15 years earlier otherwise he'd round it more, so Icon's thought on around 13 years before supers and mutants as a general concept seems about right. Which of course is all dependent on Sinister being honest with his boss. Something he's got a habbit of not doing. Of course now I"m thinking of all the retconned in activity in this time period that came after the AoA event. I Mean was this before or after the First line got killed off fighting the skrulls for example.